Whether it’s a small family gathering or a large group event, you’ll want to have the very best when it comes to bingo equipment and accessories. But why pay top dollar when you can get the very best craftsmanship at discount prices? That’s why our company is considered the place to go when it comes to providing professional quality bingo game sets! You’ll find our unique selection of small and large bingo game sets for sale to be exactly what you’re looking for in order to suit your specific needs and venue. Constructed from the very best materials, you will find sets that come with strikingly colorful ping-pong sized balls and exact-sized masterboards or smaller, marble-sized masterboards that are perfect for either senior centers or fund-raising events, or designed for an evening family get-together. No matter what you’re looking for, we have bingo sets for sale to suit your needs at prices you can afford. Check out our product line of bingo game sets and you’ll quickly discover that there’s no comparison when it comes to top quality and value-added pricing! Our Large Brass Bingo Cage for sale has an overall dimension that measures 13" wide x 16" high x 13 1/2" deep. Cage itself is approximately 7 1/2" wide x 12" deep. It comes with white ping-pong-sized balls (40mm in diameter) and a masterboard to keep track of called numbers. Masterboard is 16" wide x 20" long. 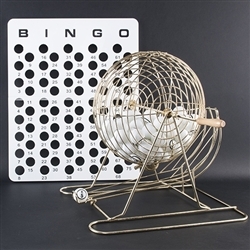 Bingo cage and balls are perfect for fund-raisers, senior centers, and special events! Bingo ball cage is made of brass with rubber coating. Bingo game cage set includes 75 colored bingo balls, a masterboard, 12 reusable bingo hard cards, and 300 plastic chips. Footprint is 12" Wide x 14" Deep x 12" High. Cage itself is 6.0" Wide x 8.5" High. Cards may vary in color from photo. 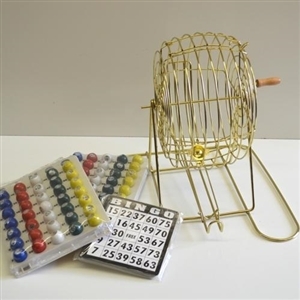 This brass coated bingo cage is the perfect size for small to medium bingo events, with the cage measuring 5.5 inches wide and the entire set stands approximately 12.2 inches tall, and a cage diameter of 9 inches, it will fit comfortably in most rooms or halls. The set also includes 20mm balls with easy to read windowed numbers, 18 bingo hard cards, and a masterboard. Everything you need to set up your own bingo night. 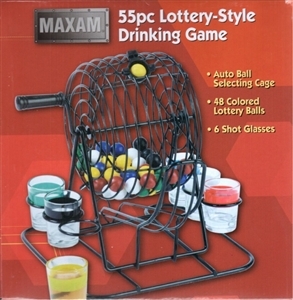 Play your favorite game at home with this complete Bingo cage set! This home bingo set comes with a cage, 75 numbered balls, masterboard to hold balls that have been called, 18 reusable cards, and approximately 150 plastic chips! Use this large bingo board when calling your bingo balls. Set the ping-pong sized balls in their designated space to ensure game accuracy. This bingo calling board holds #'s 1-75 and measures approximately 24" x 30". ONLY PING PONG SIZED BALLS will fit in this board. If you need a smaller one please look at our small bingo master board for details. Use this bingo master board when calling your bingo balls. Set the 7/8" marble-sized balls in their designated space to ensure game accuracy. Holds #'s 1-75 and measures approximately 18" H x 7" W -- THESE BOARDS ARE WHITE IN COLOR - Extra photos are for representation purposes only. Bingo can be even more fun when you're playing Drag Queen Bingo! Be the Drag Queen player with the most Drag Queen Bingo Bucks at the end of 5 rounds of Bingo and be crowned "Miss Bingo Queen of the Universe"!